My first experience of a fan heater was during my exams as an adolescent. My parents had recently converted our garage into a study and of course this was not the warmest or best-insulated space in our home. Nevertheless, it was a quiet space in which to work. In order to combat the cold, my parents ended up buying the best ceramic heater of that time. For a while, fan heaters used to be the best indoor heaters of all heater types for large rooms. Even though it was over 20 years ago, I distinctly remember the warmth it provided and the ‘click’ it made when the temperature was reached and it switched off automatically. I remember my parents telling me how lucky I was that such a thing existed and that ‘back in their day’ they’d had to make do with lots of layers and sitting in front of a coal fire. Nowadays, fan heaters are available with lots of different features, which makes it more difficult to choose the right one for your needs. To help you sort through the masses of options available, we, at The Soothing Air, have explored the market and have come up with a list of the Top Ten Best Fan Room Heaters available in 2018. It can be an overwhelming task trying to decide which fan heater to go for. A quick search for ‘fan heater’ on Amazon brings up over 400 different results! That’s a lot for anyone to sift through. Here at The Soothing Air, we’ve done a lot of the hard work for you. For example, we have reviewed over 11 different brands for this guide and spent over 72 hours researching before coming up with our Top 10. Our research involves reading real reviews by real consumers, which means we are reading real-life and recent feedback when making our decisions. We have been running methodical product research for the past five years so we have a lot of experience in our field. If you’re familiar with our reviews on The Soothing Air, you’ll know that we review products a lot and that we only have one sole aim: that is to help our readers choose products that are right for them. We always involve several people in our review process too. This allows us to ensure our final recommendations are not subjective or biased. Any review that we come across that is subjective or biased gets eliminated straight away. You can also trust that we aren’t trying to promote different brands given the number of different brands we review each time we make a product guide, whether it is a humidifier or a carpet cleaner or an air conditioner. Now, with our support and background work, you can read on in order to make an informed decision on your fan heater purchase. 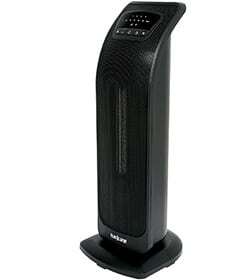 Fan heaters are one of the simplest room heaters available on the market. The name gives them away really; a fan blows heat into a room in order to raise the room temperature. When the fan heater is switched on, an electrical current runs through a heating element and converts electrical energy into heat energy. The heating element is usually made from ceramic, but it can be made from a metal wire or a convection coil. The heat produced in the element is distributed into the room by a fan placed in front of it. The fan pulls the heat into the room using air. The heating method used by fan heaters does have its drawbacks. The air flows through the fan in one direction and in a straight line, which makes some areas in the room warmer than others. This was certainly my experience 20 years ago when studying in my parents’ garage conversion! In more recent years, however, different fan heaters have become available, which aim to solve these problems. One example is circular heaters. These send out the hot air in all directions. Secondly, there are oscillating heaters. These rotate and therefore send out heat in many more directions than a standard fan heater. You can easily save on your heating costs with such a heater. Some of you reading this review might already have an idea of what key features you require from your fan heater or what the best ceramic heater looks like, whilst others might be complete novices. Here is a comprehensive list of all of the things we consider to be important when you think about buying a fan heater for your room. Cool-touch body – If you share your home with children, pets, the elderly or other vulnerable people then a cool-touch chassis is a must. You don’t want to risk accidentally getting burned if the heater is touched during operation. Overheat protection – a fan heater can be a big fire risk if it is left on for too long or the airflow is blocked by dust or an external source like a blanket. A heater with overheat protection will turn off as soon as it begins to be too hot, which means you are better protected from fire. Tip-over protection – whilst this might not happen often, there’s still a chance of a heater burning your carpet or being a fire hazard if it gets tipped over. Again, this is more likely with children and pets around so is something to consider if that is applicable to you. Even without children or pets, it’s worthwhile to keep an eye out for tip-over protect as a fan heater will be automatically turned off if it senses that it has tipped over. Type – there are many different types of fan heaters out there and what you require will depend on your needs. A portable heat bud will help you if you’re spending time in one place, for example in your dorm room or at a table. A tower will help you heat up larger rooms evenly. There are also table top fan heaters what fit anywhere yet still give great heating. So, bear in mind what your requirements are before looking in more detail at products that appeal to you. Wattage – this determines how much heat the fan heater can deliver and also gives you an insight into how much electricity it will use to run. Generally speaking, the higher the power of a fan heater, the higher your electricity bill is likely to be. But, it could be said that choosing a fan heater with a higher power means your room heats up more quickly and therefore the heating won’t be running for as long. This is of particular importance if your heater has an automatic thermostat as this will help save money by turning the heater off once the desired temperature is reached. At The Soothing Air, we pride ourselves on the methodologies behind our research and how we test and select our picks. It really is a thorough process that takes a lot of time to complete. In order to find the best indoor heaters for large rooms in our ceramic heater reviews, we began by reading existing customer reviews. During this first phase, we read through over 50000 user reviews! This meant we were able to determine what is important to consumers and whether or not they got what they wanted and needed from their purchase. From these 50000 reviews, we analyzed over 100 different products. It was, therefore, really difficult to come up with a short list but, nevertheless, we shortlisted 20 candidates. The next step of the process meant reviewing our shortlist further. This involved visiting each product’s websites and reading their product descriptions. We didn’t just rely on reading the descriptions from their own websites, however; it was important to us to get a general idea of the features usually associated with each fan heater. With this in mind, we made sure to read each item’s product description on different store pages too. Further to this, we read individual critic reviews to ensure that the information we found was accurate. For the next phase of our product research, we involved a large group of diverse volunteers. These were the same volunteers who also helped us review some of the top infrared room heaters and oil filled radiator heaters previously. We asked them to provide feedback on specific models of fan heater after having used them. With their reviews in hand, we compared their feedback and matched it against the research data we had accumulated from the web. Cross-referencing these reviews was a vital step that allowed us to determine each reviewer’s objectivity in their feedback. Finally, once all the data was compiled together in our research report, we were able to narrow our shortlist of 20 down to a Top Ten and so, without further ado, we present our findings to you. As previously mentioned, an important part of our research to find the best ceramic heater was to determine the features that users want from fan heaters. We decided that there are 29 different positive features that a fan heater can have. Most of these features we gathered from the product manuals and specification sheets for each fan heater. However, we also found features that weren’t mentioned in manuals that we think are equally important for the user to know about and have. Review frequencies tell us how many products are being sold and reviewed. Obviously, not many people who buy products actually end up writing a review about it, which is something to bear in mind. However, a higher review frequency means that more people have bought the product. Looking at these in detail meant we could determine and exclude obsolete products from our list so that we really are certain we’re giving you accurate information about the best available fan heaters in 2018. This heater is packed full of power. Other customers love it, rating it really highly. It is quiet, comes with lots of features, as well as many protection elements too. Lasko are all about heating and cooling – that’s their specialty! You can be confident, therefore, that they know their stuff and are producing some of the best products available on the market. Their website is slick and easy to use, which gives a great impression too. Now, let me tell you about why we decided that this heater is the best ceramic heater in 2018. Our research gave us a list of 29 positive features to look for in fan heaters. 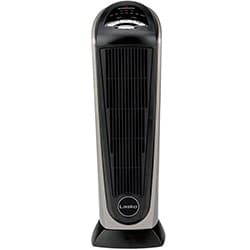 The Lasko 751320 Ceramic Tower Heater has a grand total of 22 positive features, making it the highest number of features in our list. With safety features like tip-over and overheat protection, this product will be safe for your whole family. Therefore, we can confidently say that this is the most feature-rich product we reviewed. In terms of price, we have products in our Top Ten that range from $10 to $90. This heater sells for just under $30 (at the time of research) so, not only is it one of the most affordable on our list, but it has a really higher feature-per-dollar ratio! I mentioned earlier how we read over 50000 reviews before choosing our shortlist and Top Ten, so you know reviews are an important deciding factor for us. 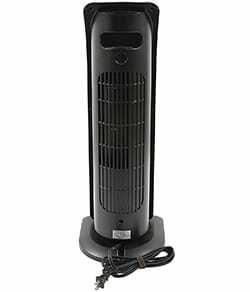 This fan heater had over 4000 reviews on Amazon alone at the time of research. This makes its star rating of 4 out of 5 even more impressive. As far as review frequencies are concerned, the Lasko 751320 received 10 reviews in around 18 days. The previous 10 reviews were received in fewer than 13 days and the 10 before that in around 16 days. All in all, this shows that this product is being sold in the hundreds within a matter of weeks! 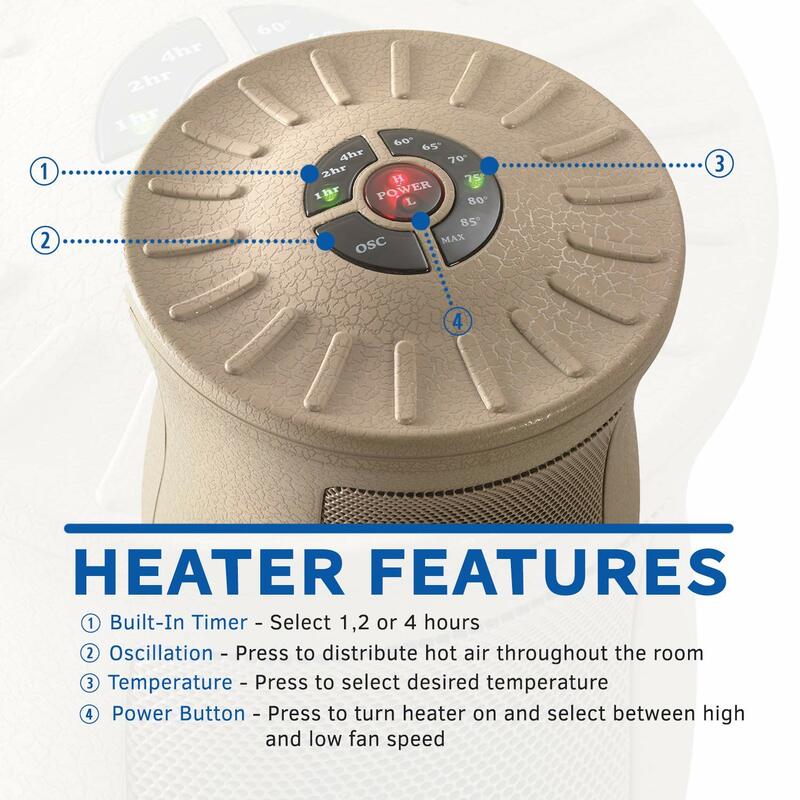 We can safely say that all of these factors make this fan heater one of the most popular products on our list. When we researched fan heaters and read reviews, efficiency was really important to consumers. This ceramic fan heater makes a great choice for saving electricity because it has a great energy conversion ratio. This means that even at 1500w, it can heat a lot faster than other heaters on the market. 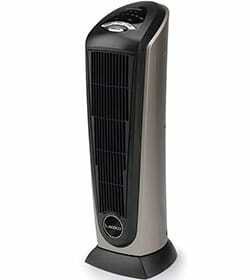 This ceramic tower heater weighs in at 6.8lbs, meaning that it is the 3rd heaviest product in our Top Ten. This does mean, however, that it is incredibly sturdy and not easy to knock over. It is also one of the larger models, measuring 7.4 x 8.7 x 23.5 inches, but this makes it really capable of doing what you need it to do in a large room. It is a great looking black and sleek design that wouldn’t look out of place in the modern home and it is manufactured in China from plastic and metal. The housing is cool to the touch so you can feel sure any little ones (pets or children!) are safer around this heater. It has the largest cord length of the heaters in our Top Ten, so as long as you place it within 1.8 meters of an outlet, it is really flexible. The handle helps with its maneuverability too. Thankfully, it comes pre-assembled so you can get to warm your space right away using its programmable thermostat. With 1500 watts of power, it is the most powerful product in our Top Ten. Alongside, you can set it according to 3 settings – high, low and auto, so there is lots of flexibility. It can be used to heat a large area so the fact that it comes with a remote control means that you don’t have to get up from the other side of the room to adjust the settings! Its low noise operations will allow you to get on with your tasks in peace without being distracted like I was by my parents’ noisy fan heater in the late 90s! Finally, it is ETL certified so you can be sure it has gone through rigorous testing and control measures. Safety-wise this heater has both overheat protection and tip-over protection, meaning you can be more relaxed that your heater isn’t going to be a fire hazard. You can also program a timer for up to 7 hours, which is ideal if you are likely to forget to turn the heater off, if you use in the bedroom for example, and fall asleep. The Lasko 751320 uses widespread oscillation to circulate the heat into the room, meaning there are fewer warm and cold spots to contend with. 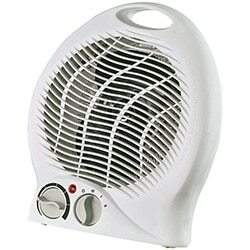 We’ve already mentioned that this heater has a great 22 positive features and excellent reviews. What is more, you can be secure in the knowledge that should anything go wrong with your product, you have a 3-year warranty too! If you want something as big and powerful as this, you really can’t go wrong. The positive reviews and high star rating speak for themselves. This is a very feature-rich but reasonably-priced ceramic fan heater that will certainly live up to expectations if reviews are anything to go by. All things considered, we think this is the best ceramic heater available in 2018. This heater is another favourite of ours. It is lighter and easier to move than our top pick, and it is also a fair bit cheaper! It doesn’t come with as many protections or digital functions, but it is still a great pick. Now, you know that we don’t affiliate ourselves with any brand but it wasn’t surprising for us to see Lasko make the runner-up spot as well as our top spot. After all, it’s clear that this is a brand that makes products that are loved by their consumers. 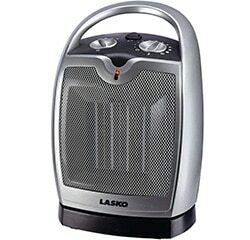 Our runner-up is the Lasko 5409, which the manufacturers describe as “small but mighty.” It is a cheaper product than our Top Pick at around $17. This fan heater can literally be picked up for pocket change! Additionally, our runner-up has a higher rating of 4.1 out of 5, a higher number of reviews (almost 6000 at the time of research) and an even better review frequency. In fact, this fan heater would have definitely been our Top pick if it wasn’t for the lower number of positive features. It has 4 fewer positive features that our number one with 18 compared to 22. The features that it lacks in comparison to the Top Pick are also quite important ones. 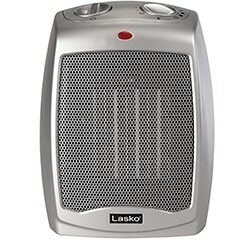 For example, the Lasko 5409 doesn’t have a remote control and isn’t programmable, so it really had to be our runner-up. Despite that, however, it still remains a great alternative to our Top Pick if you’re looking for something a little cheaper and don’t need or want a remote control. Remote controls always get lost in my house, so it’s not a big deciding factor for me! It is also a different style to our Top Pick and so might be more suited to those of you wanting a heater that is more portable and that can be put on a table top. With over 5900 reviews, you can clearly see that this product has seen many sales, especially if we consider how many people will have purchased this product without providing a review! It weighs 4.3lbs and measures 8.34 x 6.55 x 11.66 inches and, like our number 1, has cool-touch housing. It comes pre-assembled and has a handle for easy maneuverability. The cord length is slightly shorter than the Lasko 751320 at 1.5m, but it is a perfectly reasonable length, suitable for your kitchen or even the garage. It is made from plastic and metal and has an adjustable thermostat. Like most fan heaters in our Top Ten, this has 1500W of power meaning it can heat a medium to large area. It also has many different settings. You can have it at full power of 1500W, low power of 900W or just fan-only mode. It is also quiet and is ETL certified for added peace of mind. In terms of safety features, like the Top Pick, we have overheating protection with this model. It doesn’t have tip-over protection though, which is something to bear in mind, particularly with children or pets, or if using on a table top. It is also missing the timer function and has straight air circulation. We’ve already discussed the reviews and the average rating, meaning this was a strong contender for being the best ceramic heater. You can be confident in purchasing this product, especially since it also has a 3-year warranty. The price is good too! For those of you wanting a decent product that is more portable and lighter than the Top Pick and don’t mind the lack of remote control and manual settings, then this might be the one for you. It really is a bargain too! This heater gives you awesome coverage like no other. Gone are the days of patchy hot or cold spots in your room! It oscillates to heat everywhere evenly, but for that you will have to pay a higher price tag. Although our Advanced Pick doesn’t come with as many positive features as our top two picks, it still has a respectable 15 positive features. However, the features of this pick are unique and could be said to be better than the others have offered on the list. This is the only product we’ve come across that oscillates an impressive 70 degrees. This means that the heater is able to heat a wider area evenly without having too many moving parts. Since there aren’t many moving parts, the product is more energy efficient and can heat more with its 1500W than other similar tower heaters. With all its great features, the Hurricane 736607 comes with a higher price tag of around $50, making it the most expensive pick in our Top Ten. For that reason, despite having such a great feature, we’ve had to choose this as our Advanced Pick. Apart from that, this is one of the most popular products in the market. It has 10 reviews falling within 1 or 2 days. It does have the lowest average rating too, which means it can’t score higher in our Top Ten list. 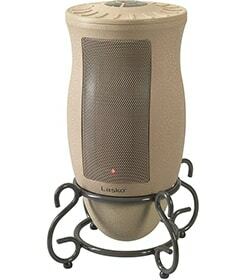 At 7lbs and 24 x 8 x 7.2 inches, this is a unique, whole-room ceramic tower heater. Its plastic casing has the benefit of being cool to the touch and comes pre-assembled and with a handle for easy movement between rooms. As expected with an advanced pick, the thermostat is adjustable too. The power is 1500w and the heater can be operated on three settings: high, low and fan only. The low noise is a great feature too. As you would expect, it also comes with a remote control, after all, it wouldn’t be very advanced without one! You have the added security of it being ETL certified. We’ve already discussed this pick’s advanced oscillation as a great feature. As well as the having a remote control, you can also set this heater on a timer, which is a nice addition. If you’ve been thinking about making a space heater yourself right at your home for some time, its features will compel you to change your mind. Although we’ve put this in 3rd place as our Advanced Pick, it does have the lowest average rating of 3.1 out of 5. This comes from over 1900 reviews. However, many of the 1-star reviews are due to the product being faulty so it is wise to make use of the manufacturer’s 1-year warranty. If you’re fed up with hot and cold spots from your existing heater, this will answer your problems and is guaranteed to give you the most coverage from one heater in a medium to large space. This heater is so small it can really fit in your hand. It is perfect for portability, as it is so compact. 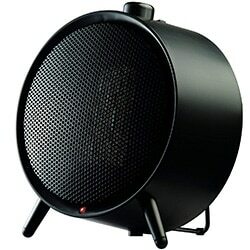 It is still safe and heats well, so this is the perfect heater if you need it to fit into a small space. You can’t get more portable than the Kaz Honeywell HCE100B – it is just as small as your palm! This means it can be placed anywhere you like so it is great for keeping you warm while you work. Because of its size, you can take it anywhere with you and it will fit easily in your bag. So whether you’re finding yourself cold at work or in your dorm, it will help keep you toasty warm in no time. It’s very energy efficient too. It is only 250W and so is perfect as a personal heater. With this power, however, you won’t be able to heat larger spaces. This product comes with a price tag of around $10, which makes it the cheapest in our Top Ten. Being the cheapest doesn’t mean it is a sub-standard product, however, it still has 12 positive features, giving it a good price-to-feature ratio. To give it even more weighting in our list, it has a good number of reviews – over 2000 in fact. This indicates how popular the product is. Also, it has a good review frequency and had, at the time of researched, received its most recent 10 reviews within 5 days. Before that it took 13 days for 10 reviews and, even earlier than that, it had 10 more reviews within 4 days. This goes to show that a lot of people are buying this product, especially since not many people who purchase items online actually end up writing a review. As well as being small (it measures just 5 x 4 x 7.8 inches), the Honeywell only weighs 1lb, meaning it is so transportable. It is a ceramic heater with cool-touch plastic housing. What’s more, it still has the join longest cord length of all of the products in our Top Ten at 1.8 meters in length. This means that, although it is portable, the manufacturers have realized it’s still important to have a long cord to ensure it can be positioned wherever you like. This heater is pre-assembled but doesn’t have a handle, not that it needs one. Due to its size and the fact it is for personal use, there is no thermostat. However, it has 2 heat settings, low (170W) and high (250W). There are caution lights so that you know when the heater is turned on. As this heater is for personal use, it is obvious that it will be closer to you. It is important therefore that it is quiet, which, thankfully, this heater is. Safety-wise, this heater has overheating protection as well as tip-over protect. So, even though it’s compact, the manufacturers haven’t compromised on safety. In terms of other features, it doesn’t have a timer, a digital clock and only has straight air circulation, but, since it’s a personal heater, it could be argued that these are not necessary features. As previously mentioned, this is the cheapest product and has an excellent price to feature ratio, costing only $9.99 for 12 positive features. In terms of reviews, it has received over 2200 and has an average rating score of 3.5 out of 5. It does have a warranty but it is worth bearing in mind that the customer pays to ship the product back to the manufacturer, which might end up costing more than a new one! If you’re wanting a quick and cheap heating solution for your dorm room or desk, this is a great buy. You can transport it easily thanks to its size and weight too! This heater is overwhelmingly popular with other customers. It has a record amount of reviews, so comes well recommended. It also has some nice extra features like its handle. Another Lasko has made it into our Top Ten! This time, the Lasko 754200. For a portable heater, it is quite heavy and weighs 3.2lbs. Don’t forget that this will give it stability though. It does have a handle to make moving it easier. It is also smaller than some of the products in our top ten and is, therefore, designed to be a table-top heater. It measures 5.75 x 7 x 9.2 inches. Whilst being warm and comforting, you can be sure to be safer with its cool-touch plastic housing. It comes pre-assembled for your convenience and has 1.8 meters of cord, which matches the longest cords in our Top Ten. 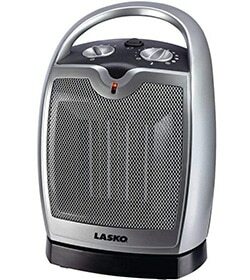 Lasko pride themselves on providing the maximum heat at 1500W. The heater can be set to high, which is 1500W or low, which is 900W. There is also the option of just having the fan in use. Despite being smaller than some of the tower heaters in our review, it is still capable of heating a medium to large space. It has manual controls and is quiet, which is great for both home and work environments. It is also ETL certified. This heater has a self-regulating ceramic element as well as protection from overheating. It doesn’t have tip-over protection, however. It doesn’t have a timer or clock either. The air is circulated in a straight direction. For $19.99, this has 16 positive features. The most impressive factor about this heater is the number of reviews it has received. At the time of research, there were over 14200 reviews! With this number of reviews, we can safely say that this product is purchased very frequently. Despite having so many reviews, this heater still retains a respectable 3.9 out of 5 rating, meaning there are a lot of satisfied customers out there. If the average rating puts you off slightly, rest assured that this product comes with a 3-year warranty. If reviews matter to you then read some of the 14000 plus reviews that this product has received! It is by far the most-reviewed product in our shortlist, with over double the amount of reviews than the second-most reviewed product. This heater isn’t going to give you a huge amount of power, but it is both cheap and portable. It only has one heat setting, but it comes well recommended with a good number of customer reviews. Another Lasko, this time we’re reviewing the Lasko 101. 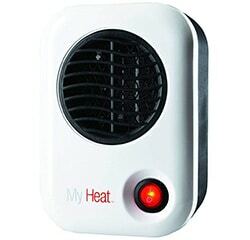 This fits into the personal heater category and is classed as a ‘heat bud’ type fan heater weighing just 1.8lbs and measuring 3.8 x 4.3 x 6.1 inches. It has a ceramic element and cool-touch plastic housing. The cord length is 1.8 meters, like the best heaters in our Top 10. Like other portable and heat bud type heaters, this comes pre-assembled and doesn’t have a handle, not that it needs one since it’s so light! Unlike our Portable Pick, this only has one single heat setting and runs at the lowest power, at 200W. This makes it the least powerful in our Top Ten list and therefore it is only suitable for heating a small area. It is quiet, however, and is ETL certified. You can see that this heater is turned on by an obvious light. It has overheating protection too for extra safety. It doesn’t, however, come with tip-over protection, which is something to be wary of if in easy reach for knocking over on a desk. The air is circulated in a straight direction. This has a great rating of 4 out of 5 coming from over 5400 reviews. This makes it really impressive as people are obviously buying this heater and are impressed with the features they get for their money. This one costs $17.23 and comes with a 3-year warranty too. If you’re not too bothered about its power and single heat setting, this might make a more reliable choice than our Portable Pick given the high number of reviews that result in its average rating of 4 out of 5. This heater looks super retro in its design, but it still works reliably and efficiently. If you don’t mind the design, then this could be a sensible and perfect choice for you. Whilst this might not be the best looking product in our Top Ten, it certainly has some good features. It weighs a light 2lbs and measures 9.25 x 10.5 x 5.5 inches. It is classed as a table top heater and has that all-important cool-touch housing. Unlike all of the other products in our Top Ten, this heater operates with a wire element instead of ceramic. With this heater, you can choose to have it running at its maximum of 1500W or a lower setting of 750W. It is suitable for heating a medium to large space and has manual controls. If sound bothers you, it is worth noting that this isn’t the quietest product on our list. It is described as producing a medium level of noise whilst in operation and you can try an oil-filled radiator if you prefer a noiseless heater. Despite its basic and somewhat old-fashioned look (this one reminds me of that 20-year old fan heater I was talking about at the beginning of this guide), it does off protection against both overheating and being tipped over. It is a simple heater; it doesn’t have a timer or a digital clock and has straight air circulation. This heater costs just under $15 and even though it looks basic, it has 14 positive features to its name. In terms of average rating, this product rates at 3.4 out of 5 from 1350 reviews, which, whilst not the highest of our reviewed products, is certainly not the lowest. What is more, this fan heater comes with an impressive 6-year warranty! This product might not look the best and may remind you of times gone by in the late 90s and early 2000s, but it certainly does the job. It’s 6-year warranty definitely adds peace of mind too! This heater is a really well rated model. It has good electronic controls, as well as digital clock and time. Although it doesn’t come with a warranty, it does boast the option of being mounted on your wall. Our number 8 is another table top ceramic heater. It weighs 2.86lbs, measures 7.5 x 5.9 x 9.4 inches and also comes pre-assembled. It is constructed of both plastic and metal, has a nice silver finish to it and is cool to the touch. It can also be purchased in black. 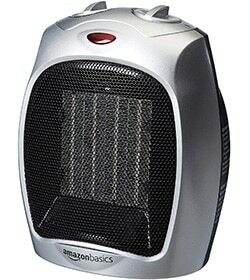 Unlike others in our Top Ten, this AmazonBasics heater can be mounted on a wall. The cord length, however, is the shortest in our list and is 1.4 meters in length. This is still plenty long enough of most people’s requirements. The handle allows it to be moved really easily. The AmazonBasics has a power of 1500W with three settings: high, low and fan only. This makes it suitable for heating a medium to large space. It does have the added bonus of electronic controls and is also pretty quiet whilst in operation. Safety-wise, AmazonBasics have it sorted with overheat protection and tip over protection. It also has a timer and a digital clock, unlike most of the products we’ve reviewed. It does only offer straight air circulation, however. The AmazonBasics matches our Top Pick with its 22 positive features and it costs a mere $23 too. However, it has the second lowest number of reviews at only 640 at the time of research, meaning that it is not a particularly popular product. It is worth noting, nevertheless, that from these reviews, this heater manages to retain a very respectable 4 out of 5 and so the number of reviews certainly doesn’t nullify this heater’s positive aspects. There is a 1-year warranty too. Popularity isn’t everything! 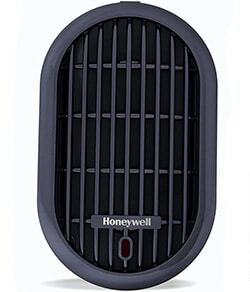 If we compare this fan heater to others in our Top Ten, it is not as frequently reviewed, meaning that it isn’t being sold in the same numbers as the products with a higher review count. It is worth being aware, though, that even though it has fewer reviews, it manages to have a high average rating. This model looks really great, and will suit any room design. It isn’t the most portable option, but it has a couple of power settings that make it able to reliably heat bigger rooms. Number 9 is another Honeywell, this time the HCE200B Uberheat. In terms of design, this certainly looks unique in comparison to others. It could even be mistaken for a speaker! It is a table-top, ceramic heater that weighs 3.9lbs and measures 8 x 5.8 x 9 inches. Although it comes pre-assembled, it doesn’t have a handle, making it less transportable that others on our list. It has an adjustable thermostat that makes it energy efficient and is made from cool-touch plastic and metal. With all that, this made it into the 9th spot on our ceramic heater reviews. There are 2 possible heat settings on this 1500W heater. It can be set high or low and is, thus, suited to heating a medium or large room. It is a low-noise device that is ETL certified. Despite its modern look, it doesn’t have modern features like a timer, a digital clock or remote control. It does offer protection from overheating but doesn’t have tip-over protection. The air circulates straight forward. This product had to feature lower in our Top Ten as it had the lowest number of reviews, with only 606 at the time of research. This is particularly low if we compare it to the product with over 14000 reviews! 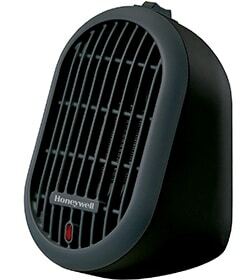 Review numbers aside, this fan heater has the second highest average rating of 4.1 out of 5. It also has 14 positive features and costs a reasonable $16. If the number of reviews puts you off slightly, be aware that there is a decent 3-year warranty on this heater, which is great considering its low cost. Again, we find ourselves reviewing a product that has much fewer reviews than many other products. However, 600 is still a respectable number of reviews, especially if we consider that they produce the second-highest average rating. This heater is more than just a heater. Its design makes it a feature piece of any home. As well as the design it heats rooms well, but comes in at a lot more expensive and more heavy than our other picks. 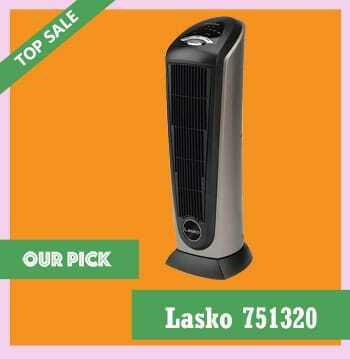 The final product in our Top Ten list is another Lasko. This time, we’re looking at a designer ceramic heater that looks somewhat like a chimenea and would, therefore, look really fitting in a glass summer room or conservatory. Part of its design means it weighs a hefty 8lbs, making it almost double that of the second heaviest heater in our list. It measures 8.25 x 8.25 x 16.05 and is constructed from plastic and metal as well as synthetic leather. There is some, although minimal assembly required and it does not have a handle, which makes moving it more difficult due to its weight. It has a decent cord length of 1.8 meters and is cool to the touch. With this 1500W heater, you get 3 settings: high, low and auto. It is ETL certified and does have a remote control for your convenience. Its weight means that this heater is really stable and safer. It has overheat protection too. There is a timer but it doesn’t have a digital clock. Finally, its rounded design allows it to have widespread oscillation so that more of your space gets heated. This is the 2nd most expensive product after our Advanced Pick and costs $41.68. Don’t let the price put you off though, it has an impressive average rating of 4.4 out of 5, which makes it the highest of all the products reviewed. This score, however, comes from only 2907 reviews, which is far fewer than others in our list. There is a 3-year warranty for added peace of mind since you’re spending a lot more buying this heater. This heater is great if you’re looking for something more unique that will not only serve a purpose in your home, but will add to it as a feature. Added to that is the excellent average rating, meaning you can be confident you’re getting a good quality product for your money. Convection Coils – these are metal coils inside the fan heater. When the fan heater is turned on, electricity flows through the coils, which are attached to a heating element like ceramic plates. The plates absorb the heat from the coils and heat up the air. Since fan heaters are open devices containing electrical components, they can’t be used in places that are humid or wet. Using a fan heater in a wet environment runs a risk of electrocution as water carries electricity very efficiently. In order to prevent fires and overheating, most fan heaters have overheating protection. Fan heaters can overheat if their air intake gets blocked so it is really important that you maintain your heater in working order. This will mean cleaning it regularly to get rid of any dust and also making sure that it is kept away from any coverings as it needs to be able to take in air easily. The overheat protection usually works through a thermal fuse, which automatically closes off the electricity supply. A second common safety feature is a tip-over switch. If the heater is tipped more than a certain degree, the tip-over switch is activated and automatically switches off the heater. The material from which a fan heater is made can have different pros and cons. With metal heaters, if there should be a fire, the casing will remain in shape and won’t catch fire. However, plastic heaters are safer in terms of electrocution if there is a fault in the heater. In our search to find the best ceramic heater, we came across loads of great products! What surprised us most was just how many reviews some of these products get. Whilst the number of reviews aren’t the be-all and end-all in our conclusions of position in the Top Ten (you will see that the product with the highest number of reviews wasn’t our first choice), they certainly add weight to the decision as they put an obvious ‘popularity factor’ into the equation. There are so many different types of fan heaters available and, whether they’re ceramic, use wire or coils, they all exist to keep away the winter chill out of your space. Of course, manufacturers know that consumers have different needs and even different tastes, which is why they produce a variety of different products. You just have to look at Lakso, for example, who manage to hold 5 spots in our Top Ten! We hope that we’ve managed to help you in your decision on which fan heater to buy, or at least narrowed down the search for you! If you’re still struggling to make that all-important decision, then our Top Pick will not disappoint! Our research report is also available for you to browse. Happy shopping!